Humphrey Plowjogger…do you think that’s a strange name? Does it sound like it’s made up? But this name just so happens to have been made up by none other than future Revolutionary/President John Adams. Humphrey Plowjogger was Adams’ pen name in the decade leading up to the American Revolution. Ben Franklin was well known as an author who made an extraordinary amount of money with his printing press. Thomas Paine wrote the inspiring works Common Sense and The Crisis while Thomas Jefferson drafted the Declaration of Independence. Heck, even Alexander Hamilton has become known for his pen due to the astounding success of the modern Broadway play. With all the brilliant scribblers counted among the Founders of the United States, it is easy to forget just how important John Adams’ hand (and mind) were to the building of rebellious sentiment in the years before the outbreak of the Revolutionary War. John Adams was an up-and-coming 26-year-old lawyer when, in early 1761, he heard James Otis orating on the illegality of Writs of Assistance. Writs of Assistance were permissions granted by the King of England which allowed for certain people to search private property, seize anything they deemed illegal, and leave without being held responsible for any damages they might cause. This is when Adams created the name Humphrey Plowjogger. He used the moniker to publish anonymously in many local papers. This was the beginning of rumblings against the crown, and it made John (whether the public knew it or not) one of the earliest agitators against the Mother Country’s mistakes. Let’s not get it twisted, Adams may have had complaints (he is legendary as a complainer), but he was still far from clamoring for independence. That being said, within four years from Humphrey Plowjogger’s first appearance in the Boston newspapers word would arrive regarding the passage of the Stamp Act. The Stamp Act required every paper used in the colonies have a tax paid which would be confirmed with a stamp. This drew the ire of most colonists for several reasons and a meeting was called for representatives in each colony to meet in New York City. This meeting became known as the Stamp Act Congress. During the lead up to the Stamp Act Congress, towns began to instruct their Representatives in how they wished to be represented. John Adams (who actually lived in Braintree and not Boston) wrote the instructions for his town. The Braintree Instructions were published in several local papers and were mimicked by the instructions written by at least forty other towns, including Boston. Although the Stamp Act Congress met almost a decade before the First Continental Congress, it can objectively be viewed as the first time all the colonies met in an effort to reduce Great Britain’s intrusion on her subjects’ rights…and the Massachusetts Delegation were already taking their orders from John Adams. After the success of the Braintree Instructions, Adams again began to publish under the Humphrey Plowjogger name again. However, John’s main problem with the Stamp Act (which many Founders discussed but is often forgotten today) was that enforcement was given taken from local courts and given to Courts of Admiralty. This meant that the decision to convict someone of tax evasion was given to one person, without a jury trial, who was paid by and responsibly only to the King. The Courts of Admiralty gave certain people unsupervised powers and took away from the Rule of Law. John Adams believed in the Rule of Law. Humphrey Plowjogger received publication as far away as London. Over the ensuing sixty years, John Adams would defend the soldiers involved with the Boston Massacre (because he loved the Rule of Law so much), attend the First and Second Continental Congress, act as a leader for and sign the Declaration of Independence, spend nine years as an Ambassador in Europe, get a significant loan from the Netherlands, act as the first American Minister to represent the United States to the King of England, oversee the establishment of the United States Senate as the first Vice President and receive election from his country as the second President of the United States. And it all started by publishing an article under a different name…Humphrey Plowjogger. Do you want to read about Adams’ longtime rival and fellow Declaration Signer? Want to learn more about the life of John Adams? Instead of my usual book recommendation, I am suggesting you watch the HBO miniseries! 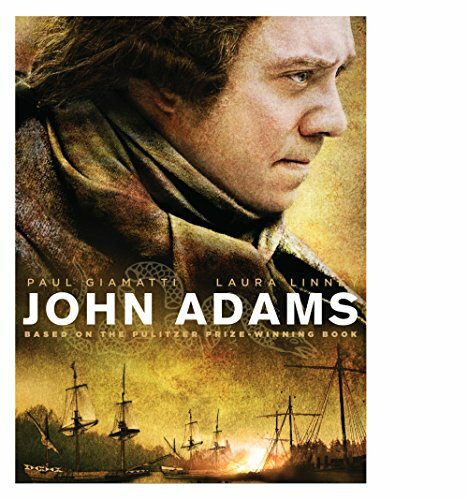 ‘John Adams’ is, in my opinion, the best film ever to document the American Revolution. It is ten hours so it might take you some time but it is totally worth it. Pick up a copy through the Amazon affiliate link below (you’ll support this site, but don’t worry, Amazon pays me while your price stays the same).